Analyze and bill active time, mind and control idle time of your staff. Get the whole picture of staff computer time with visualized active/idle time graphs. InspectSystem may be self-managed by your staff members. In visible mode, users may toggle start/stop tracking; besides, a user may be granted access to his/her personal stats online to analyze own productivity. 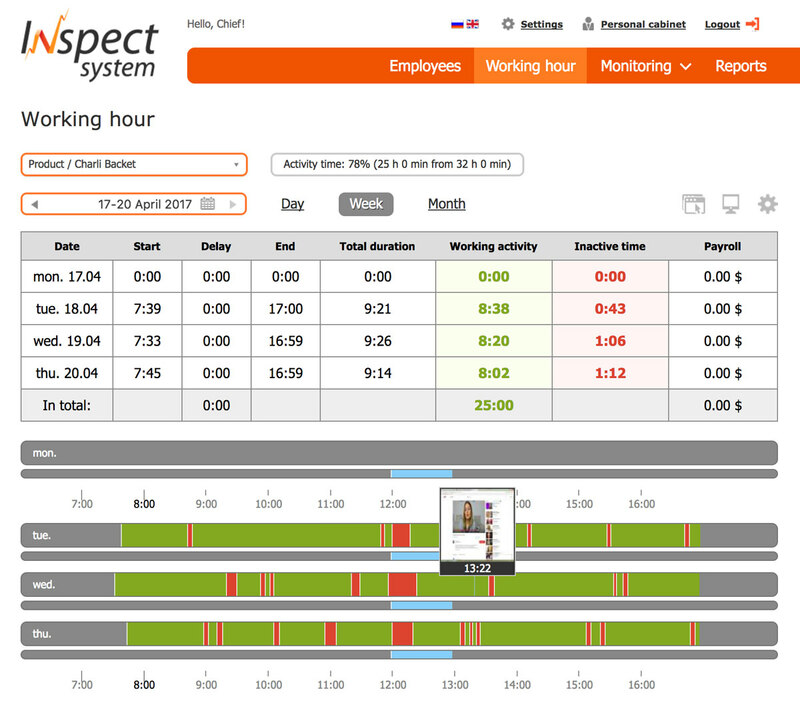 InspectSystem time tracking can automate and visualize your employee attendance control, as well as enhance self-discipline of your staff. For detailed personnel activity monitoring, try Full version. 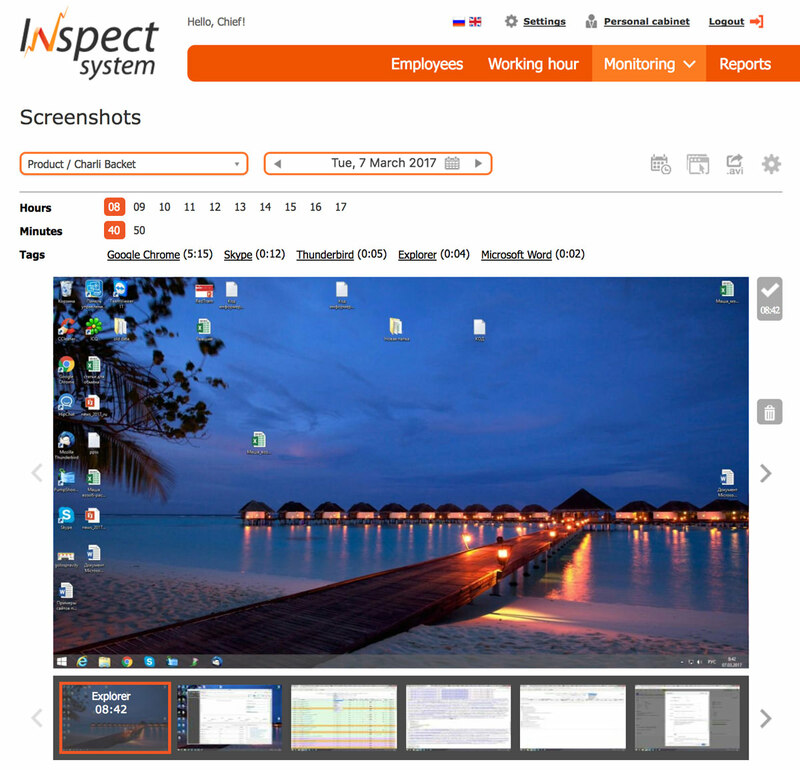 Analyze productivity with InspectSystem screenshot monitor. The service will take, arrange and keep online regular screenshots of monitored workstations. Monitor user’s active windows and sort daily results by software. Get to know actual working time spent in each active window. The software records employee’s computer activity and saves data on the server. This data may prove priceless to defend in labour disputes, to control security breaches, negligence or theft. Check, summarize and analyze time and attendance indicators: delays, idle time and interruptions. Get customizable reports. The software is managed remotely. Monitored users have minor chances to interrupt or distort collected data. Get fresh data every 60 seconds or more. Get to know exact machine time spent on every project and every file. Calculate accurate hourly wages and external billing hours. You may log in and access InspectSystem server in any Internet browser, regardless of your operating system and location. Get automated reports daily or for any desired interval. You may keep as much monitoring data as you want as you use the web service. You may set up your own InspectSystem server for your local network, with or without Internet connection.